My thanks to Terry Bateman, John Birch, Ken Booth, Don Cruikshank, Geoff Flewitt, John Harris, Bill Hartland, Les Jefferies, Steve McAllister, Bernard Mouzer OBE RVM, Bill Owens, Roy Pavely and Jenny Thompson (nee Dickinson), who contributed, some of them unknowingly, to this page. 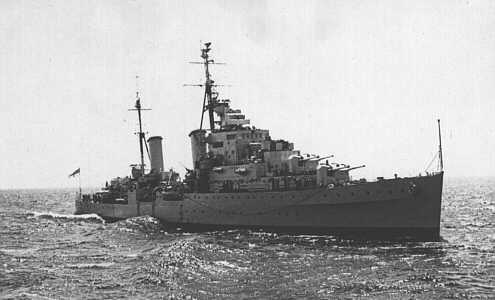 On Monday, 16th October 1950, HMS Gambia and HMS Phoebe collided while on exercise. Gambia suffered damage to her bow and Phoebe had her propellers and propeller shaft damaged. Bill Owens was a Petty Officer Writer, in 2009 he wrote saying "I had just gone up to the Supply Mess for dinner and suddenly felt an incredible 'thump', our meal ended up in our laps. I raced outside to see Liverpool sliding past to starboard - it seemed to me that I could have leapt on to her deck." This photograph must have been taken in early 1951 as Phoebe was put in reserve after she arrived back in the UK on 14th March 1951. As far as I know, after the collision in 1950, the only voyage that Phoebe made was the one back to the UK. Bernard Mouzer was a petty officer on HMS Phoebe, he kindly emailed me to say that Captain Dickinson had been hurriedly transferred to another post and that Commander Scatchard was acting Captain. Both officers were really first class people and it was a terrible shame that Scatchard should have had this misfortune. He was a hugely popular man. 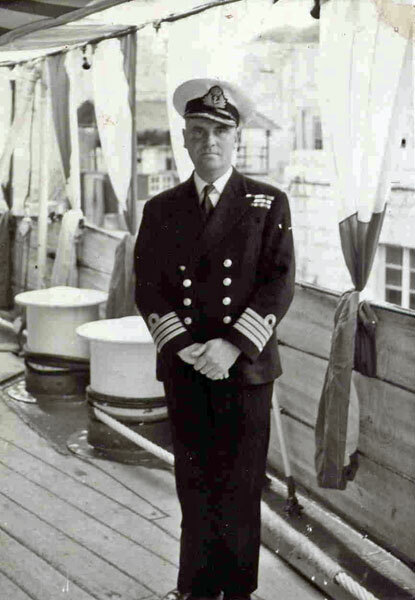 Captain Dickinson was drafted to Hong Kong in 1951. Four ships of the First Cruiser Squadron of the Royal Navy's Mediterranean Fleet, Euryalus, Gambia, Liverpool (flagship) and Phoebe were involved in a replenishment exercise. Also taking part were the frigates Magpie and Surprise and a destroyer flotilla made up of Chequers, Chiders, Chevron, Cheviot, Chevrolet, Chieftain, Gravelines and Vigo. There were also several other ships and submarines involved. On Gambia at least, tannoy announcements kept the crew informed which ships were in the vicinity and their position. Gambia was in the centre, Liverpool to starboard (right) and Phoebe was to port (left) with Euryalus around three and a half cables astern of (behind) Gambia. A cable is 608 feet so Euryalus was about 2,100 feet (710 yards) behind Gambia. The exercise took place in the Eastern Mediterranean, near Malta and involved transferring fuel and rigging jackstays for the transfer of mail, personnel, stores and ammunition between the ships. The following photographs illustrate what happens during these operations. The following is my interpretation of what happened. I wasn't even born till eight years after the incident so the following is an amalgamation of my correspondence from people who were there and from the information given on various web sites. Some people I've spoken to insist that the collision was Gambia's fault, others say it was Phoebe's. The purpose of this article isn't to apportion blame to anyone. In his albums dad had some photographs of the damage done to Gambia's bow, this page is the result of my trying to find out how it happened. At around 1pm, the ships were moving at around 14 to 16 knots. A knot is a nautical mile an hour. A nautical mile is is 6,080 feet (6 feet = 1 Fathom, 100 fathoms = 1 cable, 10 cables = 1 mile, 3 miles = 1 league) A land mile is 5,280 feet. For an extensive explanation of Naval slang and terms see the Royal Navy site. The transfer between Chieftain (on the starboard side) and Gambia had just been completed. Chieftain had moved away and Liverpool was just taking up station. The transfer between Phoebe (on the port side of Gambia) and Gambia was completed and Phoebe increased speed to around 18 knots. At this point the transfer of fuel and goods between Gambia and Liverpool was still taking place. 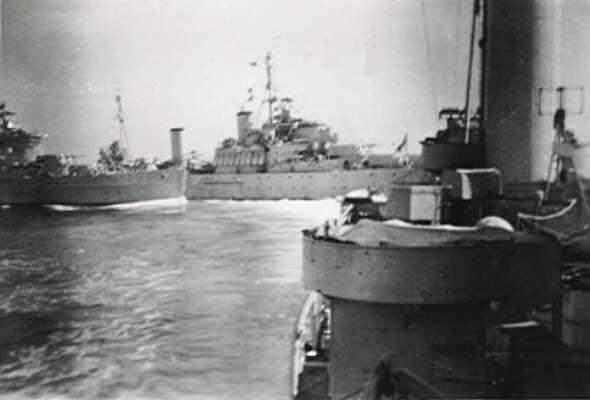 HMS Phoebe coming alongside HMS Gambia. No one was aware of what was about to happen. What happened next is a bit confusing. Either Phoebe misjudged the how far she was ahead of Gambia and steered to port which caused her stern to move to starboard, towards Gambia OR Gambia was caught in Phoebe's bow wave and swung to port OR Gambia steered to port. Whatever happened, the stern of Phoebe collided with Gambia about 20 feet back from Gambia's bow. The ships began to slew around and the Gambia's bow hit Phoebe a little forward of her stern, the momentum of the ships caused them to both start to roll and crewmen were knocked off their feet. By now Liverpool was in danger of colliding with Gambia. 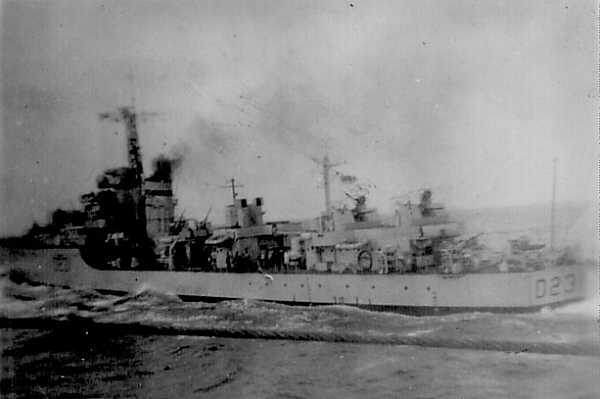 Phoebe then steered to starboard and increased speed to full ahead to clear her stern away from Gambia. While doing this she had to pass in front of both Gambia and Liverpool. Don Cruikshank says that both Gambia and Liverpool ordered full astern then opened the boiler safety valves, but he was on Euryalus and several people have emailed to say that they didn't. Nobody was in the jackstays at the time but the stores that were being transferred went into the sea. The fuel line between Gambia and Liverpool parted and Liverpool was sprayed with bunker oil. Don Cruickshank was Midshipman of the Watch on Euryalus and said that "it became inevitable that a collision would occur. Indeed it looked as though three quarters of the Second [First?] Cruiser Squadron might well go to the bottom that afternoon." 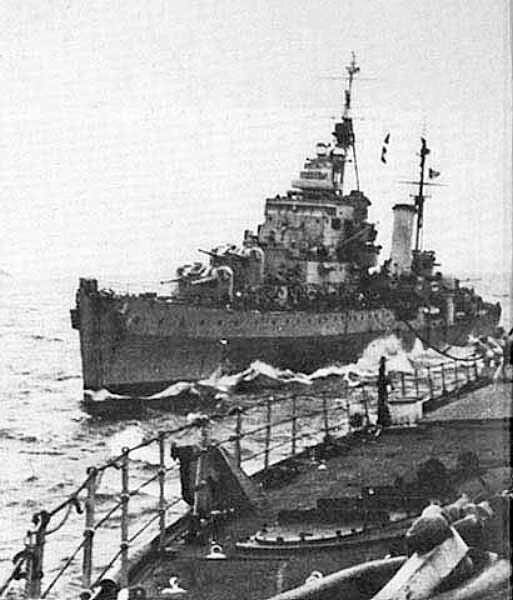 In his article Don said that he was in the Second Cruiser Squadron on HMS Euryalus, but Gambia, Liverpool and Phoebe were all in the First Cruiser Squadron. 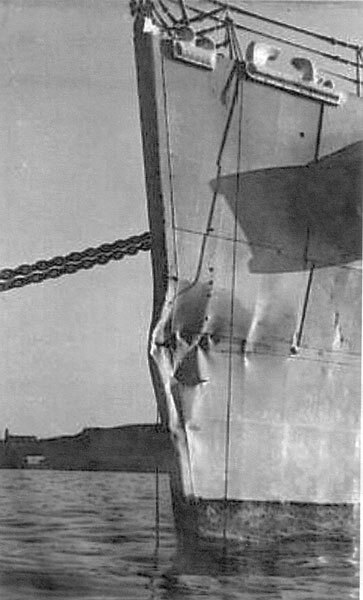 Gambia's bow collided with Phoebe's stern and the damage to both ships was extensive. Liverpool managed to barely able to squeeze between the two just after. Don said that "They must have been incredibly fast in their engine rooms to have reacted so quickly." The scene from Phoebe's flag deck shortly after the collision. Gambia astern of Phoebe, with Liverpool approaching from starboard with the apparent intention of ramming Gambia! One of John Birch's photographs taken just after the collision. John wrote that "You will see by Phoebe's extended wake, that she was running around like a "chook" with its head cut off!!!" Gambia's port bow was damaged below the water line which produced flooding in some forward compartments and some bulkheads had to be shored. John Birch was aboard Gambia and said that "The ship was placed in a relaxed state of damage control, 'X' doors and hatches were closed and the manhole covers to the lower deck were opened. Since the incident took place during the dinner hour mess decks were crowded. People in the forward lower mess deck must have thought that the world had come to an end." The blades from Phoebe's outer starboard propeller were ripped off leaving the hub on the shaft which was buckled all the way to the engine room. The squadron made its way back to Grand Harbour, Malta and arrived there early the next morning. On Monday 23rd October Gambia went into Number 5 Dry dock, where she stayed until the 17th November. Sailing on the 20th November to anchor in St. Paul's Bay to paint ship for three days. Phoebe was refitted in Malta. She spent Christmas there and sailed for home, the damaged shaft secured to her deck, to arrive in Chatham on 14th March 1951 at the end of her foreign commission and put into reserve. 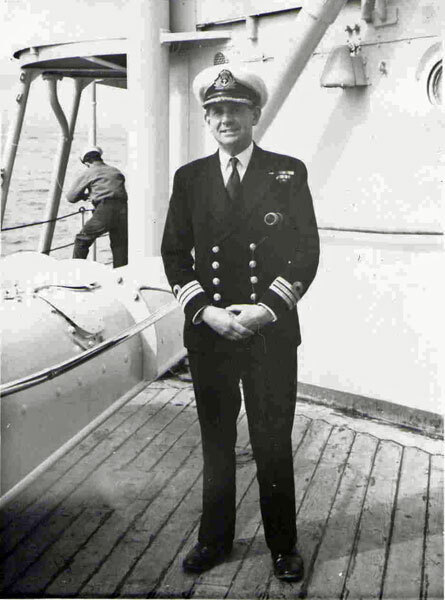 Denis Vichion served on HMS Phoebe from 1948 to 1951 as an ordinary torpedoman. In 2008, he gave an interview with Peter M. Hart for the Imperial War Museums' Oral History archives. In that interview he says that while HMS Phoebe was in dry dock in Malta, a new new propeller shaft was delivered. The shaft was 30ft long and unfortunately no one realized that the dry dock was not long enough to remove the damaged shaft and replace it with the new. This portion of the recording comes from Part 10, Reel 5 of the interview that appears on the Imperial War Museums website. I should imagine that like the Army, the Navy doesn't like having its goods and chattels damaged. I expect there was a lot of form filling and gnashing of teeth over this incident. Monday 16th October, at sea with the 1st Cruiser squadron and 1st Destroyer flotilla. At approx. 11.30, Phoebe was passing up the Port side when she came in too close and damaged our bows by cutting gouges in it with her propeller. This took place in the Eastern Med. We broke off the Exercise and proceeded to Malta, where we arrived the next morning at 07.00. On Monday 23rd October we went into Number 5 Dry dock, where we stayed until the 17th November. Sailing on the 20th to anchor in St. Paul's Bay to paint ship for three days. Phoebe was due for return to the UK but had to remain in Gibraltar for repairs to her propeller, they were not best pleased with Gambia!! 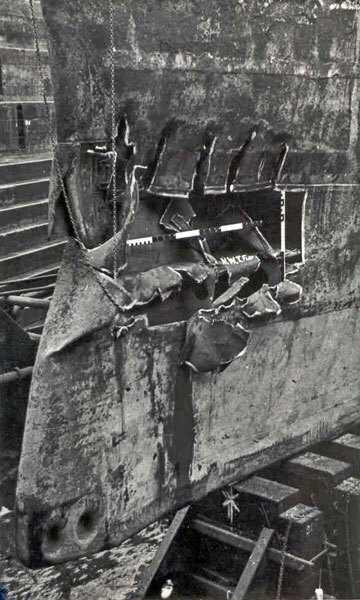 Ken also very kindly sent me the following photograph of the damage to HMS Gambia. NB. Where Geoff says "you" he's referring the notes that Ken Booth emailed me and which I put on the page. The date of the incident is about the only thing on which you and I agree!! You say that "at approx 1130 Phoebe was passing up the port side when she came in too close and damaged our bows by cutting gouges in it with her propeller". In fact, Phoebe and Gambia had just successfully completed a jackstay transfer, Gambia having come out from Malta - bringing mail - to rendezvous with the rest of the squadron; the purpose of the rendezvous as I remember it was to facilitate the taking of an aerial photo of the 1st CS for that year's Christmas card. The transfer was effected with both ships at 14 knots, and on completion Phoebe increased to 16 knots, to make way for Euryalus to carry out her jackstay transfer. 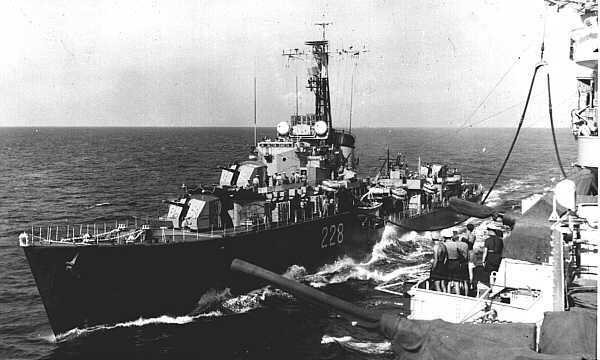 Before Phoebe was clear of Gambia, the latter turned to port, and raked the starboard quarter of Phoebe with her port bow. Phoebe was dry-docked on arrival in Grand Harbour, and we were able to see that the starboard outer screw had just three stumps around the hub where the blades had been! The attached photo (above) was taken from Phoebe's flag deck just after the collision, and shows Gambia astern of Phoebe, with Liverpool approaching from starboard with the apparent intention of ramming Gambia!! Fortunately Liverpool was able to pass between the other two, albeit with not much room to spare! You say the the incident took place in the Eastern Med; as we were all in Grand Harbour the following morning, we could not have been very far east. Further, you state that "Phoebe was due for return to the UK, but had to remain in Gib for repairs to her propeller". Phoebe was actually due home by March `51 at the end of her foreign commission, and did indeed arrive in Chatham 14th march `51. She did not see Gib until on passage home. The starboard outer shaft had been put out of alignment by the collision, and the upshot of this was that it was decided to refit Phoebe in Malta (we spent Xmas in dry dock, where else would you rather be!! ), then send her home and put her into reserve. She sailed home with the damaged shaft secured on the upper deck. I was a telegraphist aboard Phoebe, the photo was taken by one of my messmates (Tel Les Jefferies) with my good old Brownie Box camera! NB. Don seems to have confused Gambia and Phoebe in this account. Everyone else agrees that Gambia was in the centre, Liverpool to starboard and Phoebe was to port. 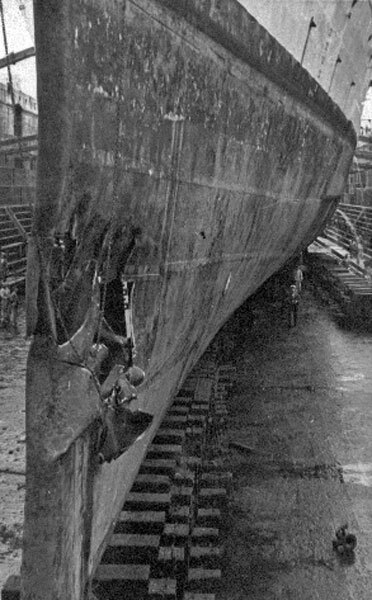 Gambia suffered damage to her bow and Phoebe to her stern and propeller and shaft. Don also says the accident occurred on Sunday, but other people insist it was a Monday. Despite these inaccuracies, the article still helps to illustrate what happened that day. A brief account of an notable collision between two warships in the Mediterranean in 1950. 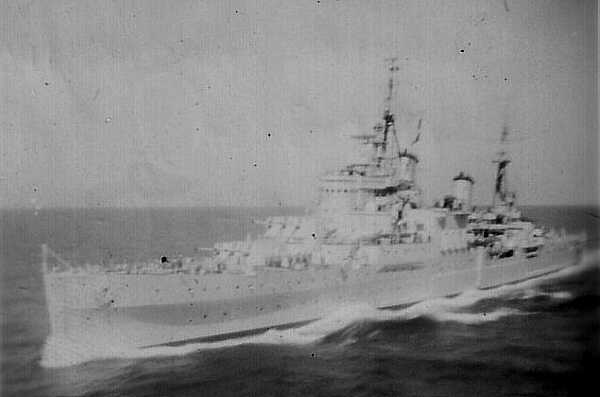 I was serving in the Second Cruiser Squadron of the Royal Navy's Mediterranean Fleet as a Midshipman aboard H.M.S. Euryalus. The squadron comprised four cruisers, HMS Liverpool (the flagship with an admiral aboard), HMS Phoebe, HMS Gambia and ourselves. We were at sea on a fine sunny Sunday afternoon in company with a number of escorting destroyers. A replenishment exercise was under way in which only the other three cruisers were directly involved; Euryalus had been ordered to take station three and a half cables astern. My duty as Midshipman of the Watch on the bridge was to squint into the rangefinder and keep us on station by adjusting our rpm fractionally up or down as required. The three cruisers taking part were to rig jackstays to exchange mail, personnel, stores and ammunition and to connect hoses to transfer oil fuel back and forth between them. 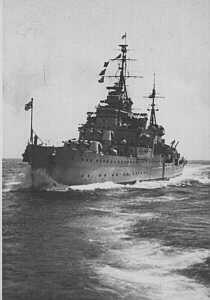 They were steaming at 18 knots, with Liverpool to starboard, Phoebe in the centre and Gambia on the port side. This type of exercise was undertaken routinely to keep all the crews familiar with the operations involved. The three ships took station and established a flow of oil and goods satisfactorily. Gambia completed the required transfers first, disconnected, retrieved all her gear and increased rpm to clear ahead. Liverpool and Phoebe were still connected and exchanging goods and fuel. 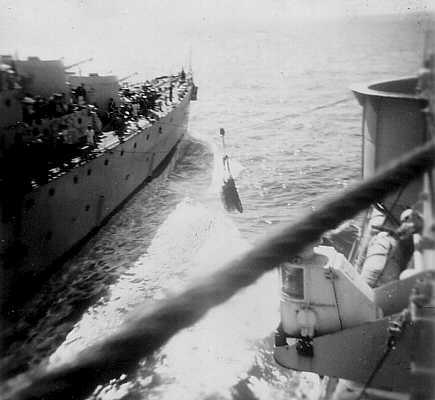 As Gambia went ahead the forward part of her hull cleared the effect of Phoebe's bow wave and the ship's head started to swing to starboard. A bit of port helm was applied to correct this swing. Her stern, alas, drifted perilously close to Phoebe's bow, requiring a sharp correction to starboard to prevent the starboard outer propeller from opening Phoebe like an oversized can opener. At this point things started happening fast and silence fell on the bridge of my ship as we watched with fearful anticipation. With the application of starboard wheel Gambia's head passed through the exercise course and again swung into the path of the still connected cruisers. Faced with the need for an immediate decision, Gambia ordered full ahead (that's navy for emergency power) and hard to starboard in an effort to pass ahead of Phoebe and Liverpool. From our vantage point it was clearly impossible for her to make it across. A serious accident was about to happen, and it did. Seeing Gambia's plight, both Phoebe and Liverpool went full astern (emergency power again). Happily there was nobody on the personnel jackstay at the time, as stores cascaded into the water, fuelling hoses parted and black bunker oil sprayed over the side and superstructure of the the flagship, Liverpool. Both Phoebe and Liverpool lifted their boiler-room safety valves and a scene of devastation unfolded before us. Time seemed to stand still from the moment at which it became inevitable that a collision would occur. 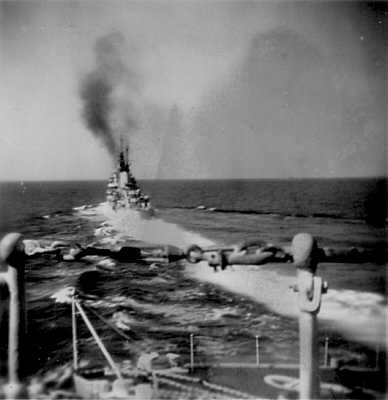 Indeed it looked as though three quarters of the Second Cruiser Squadron might well go to the bottom that afternoon. When Phoebe plowed into Gambia's quarterdeck the noise was horrific. Still not a word was spoken as our Captain, Commander and Officer of the Watch stood with binoculars trained on the scene. Miraculously, and to this day I don't know how they did it, Liverpool managed to slow and swing clear without direct involvement in the actual collision. They must have been incredibly fast in their engine rooms to have reacted so quickly. Equally amazing was the merciful fact that nobody was seriously hurt in what could easily have been a most costly incident in human terms. 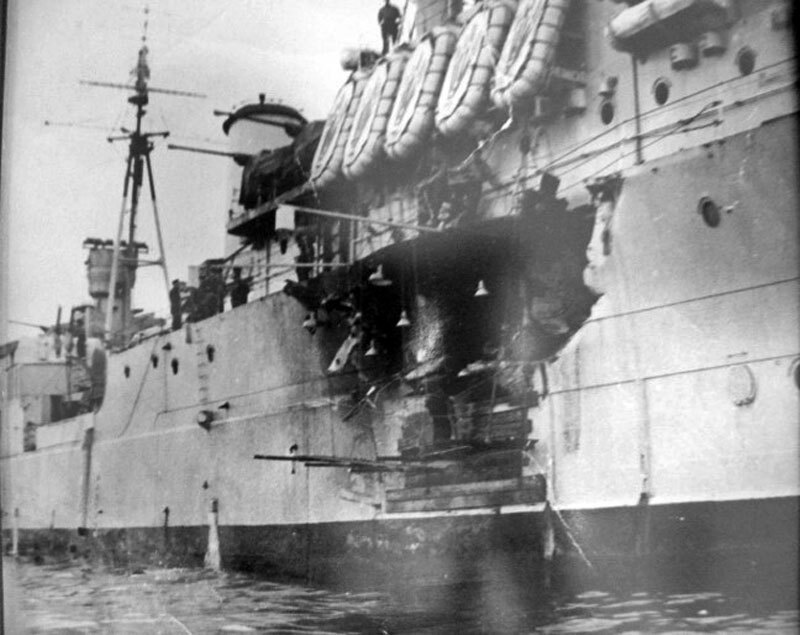 The damage to H.M.S. Gambia was extensive, both starboard shafts buckled with consequences all the way to the engine rooms, and the ship was retired from service. Phoebe's bow was rebuilt and she returned to service for a short while before also being consigned to the scrapyard. I was back in college again when the courts martial rendered their decisions and apportioned responsibility for the fiasco, but I'm sure one or more officers' careers took abrupt turns for the worse as a result. Being from the engineering fraternity myself I heard little of the fallout from this accident though I have always assumed that the ship handlers of the future must have had this incident dissected in some detail for them countless times to ensure that the lessons associated with bow wave pressure effects were learned in the classroom rather than via the more expensive school of hard knocks. I would like to add my memories of the incident. It took place during the first hour of the afternoon watch, I was on the fo'c'sle at the time. Gambia was steaming a fixed course and speed, transferring oil fuel to Liverpool from the starboard side; Phoebe was on the port side receiving a transfer by Jackstay. On completion of the transfer, Phoebe gathered speed and proceeded to steam ahead but her stern swung to starboard and came into contact with Gambia's port bow. The finding of the enquiry are unknown to me but, on reflection, I assume that someone on Phoebe's bridge misjudged the distance that they were ahead and executed a turn to port, which would explain the swinging stern. The resulting damage was rather more than a "bent bow", as reported in the Times of Malta. It was quite extensive below the waterline, as the attached photographs illustrate. Flooding took place in some forward compartments and bulkheads had to be shored. Gambia proceeded at reduced speed to Malta and dry dock. The ship was in a relaxed state of damage control 'X' doors and hatches being closed, manhole covers to the lower deck were open. Since the incident took place during the dinner hour mess decks were crowded. People in the forward lower mess deck must have thought that the world had come to an end. Note! The rum was stored aft and perfectly safe. Reading through the article by Don Cruickshank made me realise just how witnesses interpret an incident so differently. As the photographs taken from Gambia show, Gambia was acting as supply ship and other ships were being supplied From BOTH SIDES. Ships on the starboard side were receiving oil and Mail (which had been delivered by Helicopter to Gambia, was being transferred by Jackstay from the port side. Liverpool had just taken up position to Starboard and connected the hose, Phoebe cast off the jackstay and moved ahead, the sea was calm and the bow wave was minimal. Gambia was steaming on a fixed course. Phoebe turned to starboard and cut across Gambia's bows and that was when the collision occurred. I was standing on the port side of the Forecastle deck and witnessed the whole sad event. I never discovered the results of the court of enquiry, but Gambia's Captain was later promoted to Rear Admiral, which I doubt would have been the case if he had been found guilty of writing off a cruiser. Phoebe was patched up in the Malta dockyard and returned to Chatham, where I understand she remained until sold for scrap. My memory of the event is as clear today as it was in 1951, even the site of Jock Dray, the electrical mess rum bosun climbing through the forward hatch with the rum fanny clutched in his arms… and he didn't spill a drop. I was up on the Port Wing of the Gambia's bridge on the Bofor gun deck taking a break, looking right down on the action watching the transfer of mail to the Phoebe. When the transfer was completed the Phoebe began to draw away however her stern began to slide in towards us, the swinging stern (propeller) caught us in the lower under water portion of the Port bow back from the bow about 20ft, the Upper Starboard Quarter whacked us right on the bow and stem. The whole forward portion of the ship (Gambia) jumped and juddered with the rotation of the Phoebe's props, the Gambia's bow contacted the Phoebe's Port Quarter and began to push the Phoebe and ride her over about midway along her Quarterdeck the whole ship began to rollover crew members on the deck began to slide down the deck however she was going hard over to Starboard and moving the ship manage to tear and slew out from under us, whipped about a bit and cleared herself. As for the Liverpool she was almost up against us with her bow off the Starboard Waists, Mountbatten was standing up on the rim of the Liverpool's bridge giving directions or asking what was going on, I unfortunately cannot remember what he said. Standard procedure if I remember my Seamanship was for the ship doing the transferring of cargo, mail, oil or whatever was to maintain course and speed at all times whilst performing the function. All ships to have completed receiving and moved out of maneuvering area of delivering ship before she altered course or speed. 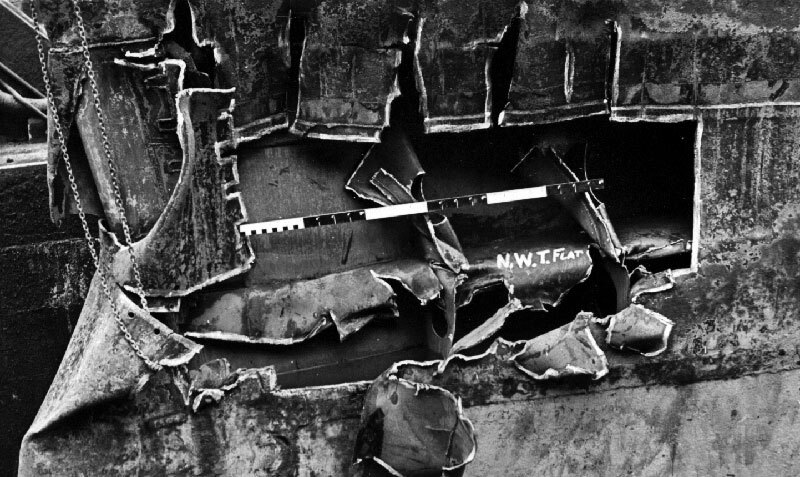 In February 2019, Terry Bateman sent me the following photograph of the damage done to HMS Phoebe, the only one I've ever seen. The damage is much further forward on Phoebe than I had previously thought from the descriptions of the accident. Terry wrote that his father Roy Bateman served on Phoebe between 1948 to when she was scrapped in 1951. Sadly, Roy passed away in 2014. William Lightfoot was born in Ilford in 1932. He was serving on HMS Phoebe at the time of the collision. He was looking forward to being at home on leave for Christmas, but the accident meant he didn't get home again until February 1951. My thanks again to Terry Bateman, John Birch, Ken Booth, Don Cruikshank, Geoff Flewitt, John Harris, Bill Hartland, Les Jefferies, Steve McAllister, Bernard Mouzer OBE RVM, Bill Owens, Roy Pavely and Jenny Thompson (nee Dickinson), who contributed, some of them unknowingly, to this page. I'm sorry to say that I was informed by his granddaughter, Clare, that Geoff Flewitt died in February 2006.